Creating a PowerPoint presentation is no small task! It requires juggling all sorts of PowerPoint stuff like charts, tables, pictures, object formatting, text and shapes just to create your slides in the first place. Then there is the delivery of the presentation itself. On top of that, companies, bosses and clients want everything done yesterday. For you as an employee (or contractor) that means expectations are rising. Getting more done in less time. That’s where PowerPoint Keyboard Shortcuts come to your rescue. To help you out, I’ve pulled together this list of 80 PowerPoint shortcuts you can start using straight away. With a little bit of practice, these PowerPoint shortcuts will seriously cut down your build time, make your slides look more polished and professional and get you to Happy Hour. One of the main reasons to learn your keyboard shortcuts is they eliminate mental stress and anxiety. Studies show that one of the main sources of modern stress and anxiety in the workplace is what researchers call Cognitive Load. The point being that your brain can only make so many decisions a day before it basically shuts down. That’s why high profile leaders like Steve Jobs, Barack Obama and Superman focus on wearing one or two outfits everyday. It cuts down on the decisions they need to make, allowing them to focus on higher priority tasks. How do keyboard shortcuts help you out here? They eliminate a bunch of micro-decisions and mental hoops your brain otherwise has to process to get a task done. So instead of playing hide-n-seek in the ribbon for your command – let me see…where was that command again? – your fingers just hit the keys and get the task done. Decreasing your cognitive load. 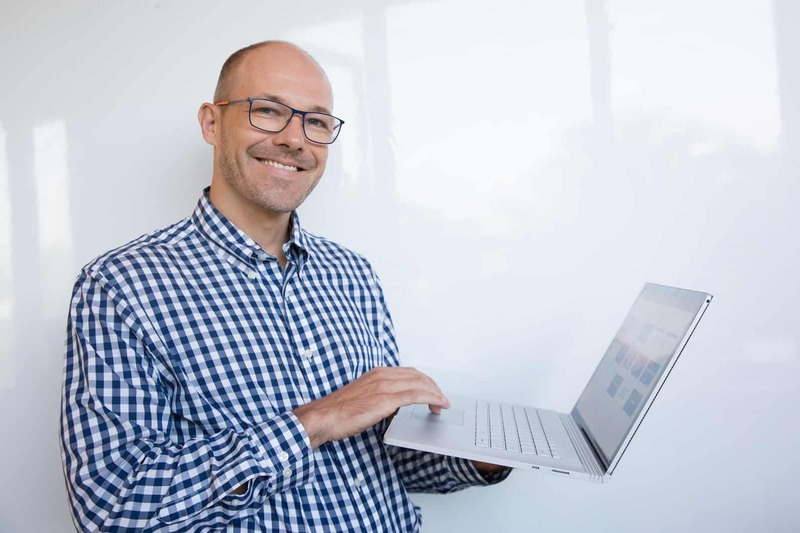 In that sense, your keyboard shortcuts not only decrease your cognitive load, freeing up your mind for higher priority tasks, they also blast through your otherwise repetitive and annoying tasks for you, getting you to Happy Hour. To see a break out of the best 25 PowerPoint shortcuts based on a survey of over 30,000 professionals, check out the Top 25 PowerPoint Shortcuts. 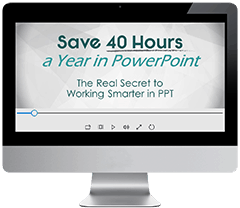 If learning your PowerPoint shortcuts was easy, everyone would already have their black belt in PowerPoint, but they don’t. So the very first rule is simply – COMMIT. Define your goals. If there are 100 keyboard shortcuts you want to learn and you can only learn 2 or 3 a day, break it up. Don’t worry about the 100, just worry about the 2 or 3 you want to learn that day (or that week). When you first learn a new keyboard shortcut, the most important thing is to start using it every single time you want to complete that task. A common learning mistake is not consistently using the shortcut right off the bat because it’s not comfortable. Disclaimer: When you first start learning your keyboard shortcuts (for whichever program in which you are working), you might not feel any faster, or you might even feel slower. That's because it's new and uncomfortable. But trust me, the fastest people in PowerPoint use shortcuts. And that can be you. Don't give up. 3. You Don’t Need to Learn All Shortcuts. Just because a shortcut exists doesn’t mean you should learn it. There are hundreds of keyboard shortcuts and thousands of commands you can set up as shortcuts in PowerPoint that you’ll never need to use. That’s why I recommend that instead worrying about all of the available shortcuts, just focus on learning the keyboard shortcuts around the core activities you perform every single day. While in Slide Show mode, to display the All Slides dialog box hit CTRL + S.
This dialog box allows you to visually see all the slides within your presentation and quickly jump around between them. This is handy when you want to quickly move forwards or backwards within your presentation and you don’t know what the slide number is. When you give a presentation, your topic never goes in the order you planned. There are some situations when you require going to nonadjacent slides in your presentation. For instance, say you are on slide 50, and your audience puts a question that requires you to jump to slide 20. Pressing Page Up 30 times doesn’t seem professional. For easily jumping to the 20th slide, simply press the slide number while in slideshow mode and then press the Enter key (20 + Enter). Sometimes you may need to pause the presentation for lunch break or to answer a question unrelated to the presentation. In these situations, B and W shortcut keys to display a blank screen. Pressing B or W second time will pick up the show where you left it. You can select the slides all at once if your presentation is in slide sorter view. To do this, press CTRL + A. Remember, this PowerPoint shortcut will work only if your presentation is in Slide Sorter View. To add the copy of the current slide in your presentation, press CTRL + SHIFT + D.
To view the presentation in Slide Show Mode from the very first slide, in all versions of PowerPoint, simply hit F5. To view your presentation from your current slide (all versions of PowerPoint) in Slide Show Mode, hit SHIFT + F5. To move to the next slide, hit Page Down. To move to the previous slide, hit Page Up. While in Slide Show Mode, hold down the CTRL key on your keyboard and click and drag with your mouse. Holding the CTRL key and dragging around with your mouse turns on the laser pointer to draw your audiences’ attention to different aspects of your slide. In the Slide Show Mode, to write on your slides with a pen, hit CTRL + P and use your mouse (or pen if you have a touch screen) to write and/or draw on your slides. Hitting CTRL + P a second time will turn the Pen off. In Slide Show Mode, to write on your slides with your highlight, hit CTRL + I and use your mouse (or pen if you have a touch screen) to highlight and draw on your slides. This is a great trick when leading online training and webinars, as you can add notes live onscreen and bring attention to different areas of your slides. Hit CTRL + M to hide the ink. And if you do so a second time, you will make the ink re-appear. ​Press E at any time to erase all of the ink on that slide. Be careful when erasing the Ink on screen as there is no way to un-erase that ink. If you typically want to save the ink on yours, memorize the CTRL + M shortcut instead as it merely hides the ink. To hide pointer and navigation immediately, hit CTRL + H.
To hide pointer and navigation after 15 seconds, hit CTRL + U.
Pointers and navigation button could be annoying to the audience. So it’s important to hide while giving presentation. While in Slideshow mode, this command is the equivalent of right-clicking on the screen, displaying the different presentations options available to you. While in Slideshow mode, this command display all the different slide show shortcuts you can use to quickly navigate your presentation. If you ever forget your shortcut, just hit F1. While in Slide Show mode, you can display the task bar at the bottom of your screen by hitting CTRL + T.
Displaying your taskbar is a fast and easy way to navigate between different documents and files on your computer without closing out of your presentation. Select the text or object on which you want to apply a hyperlink in PowerPoint, and hit CTRL + K.
The cool think about hyperlinks in PowerPoint, is that they carry over into the PDF file format. For more information, see Convert PowerPoint to PDF. While in Slide show mode, to go to the first or next hyperlink on a slide hit the TAB key. While in Slide show mode, to go to the last or previous hyperlink on a slide, hit SHIFT + TAB. Once you’ve navigate to a hyperlink (using the above keyboard hot keys) you can activate it by hitting the ENTER key. ​Hit the END key ​​​​​move to the end of a line. Hit the HOME key to move the beginning of a line. To promote a paragraph, hit ALT + SHIFT + Left Arrow. To demote a paragraph, hit ALT + SHIFT + Right Arrow. 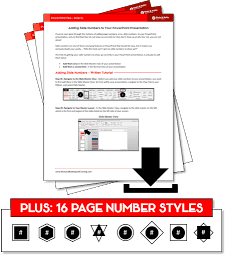 These List Level Shortcuts are extremely effective when filling in company templates as it properly uses the bullet spacing set on your Slide Master. This is entirely different than the Promote and Demote paragraph shortcuts. To see how to use these List Level Shortcuts to properly fill in a company PowerPoint template (and see how they are COMPLETELY different than the TAB and SHIFT + TAB shortcuts) see the short YouTube video below. To promote a paragraph, hit the TAB key. To demote a paragraph, hit SHIFT + TAB. To move selected paragraphs up, hit ALT + SHIFT + Up Arrow. To move selected paragraphs down, hit ALT + SHIFT + Down Arrow. When in a shape or text box, within text editing mode (blinking cursor), hit CTRL + A to select all the text. To delete one character to the left, hit the BACKSPACE key. To delete one character to the right, hit the DELETE key. To delete one word to the right, hit CTRL + DELETE. To increase the font size, hit CTRL + SHIFT + , (comma). To decrease the font size, hit CTRL + SHIFT + . (period). To open font dialogue box to change formatting of the characters, hit CTRL + T.
Hit SHIFT + F3 to toggle the case of the letters between lowercase, sentence case or uppercase. ​Hit CTRL + = (equal) too apply subscript formatting with automatic spacing. Hit CTRL + SHIFT + = (equal) to apply superscript formatting with automatic spacing. Select the text, and hit CTRL + B to make it bold. Select the text, and hit CTRL + I to make text italic. Select the text, and hit CTRL + U to give it an underline. To open up the spell check engine to double-check your spelling and grammar, hit the F7 function key. To open thesaurus, hit SHIFT + F7. To select all the objects on a slide, with the slide space active (click somewhere on the slide to be sure), hit CTRL + A. To copy the formatting of text or of an object, select it and then hit CTRL + SHIFT + C.
To paste the formatting of text or of an object onto another object, hit CTRL + SHIFT + V.
The "Format Dipper" is one of the fastest way to pick up and apply formatting styles throughout your presentation. It’s also extremely easy to learn as it mimics the standard CTRL + C to copy and CTRL + V to paste shortcuts (just add in a SHIFT in the middle). Easy as pie! The Paste Special shortcut gives you a variety of pictures format paste options for your content. To use the shortcut first CTRL + C to copy something in PowerPoint, then hit CTRL + ALT + V to open up the Paste Special options. The Paste Special dialog box is where you can find the WMF and EFM file formats for breaking apart your copied PowerPoint Tables and PowerPoint charts. To group selected objects on a slide, hit CTRL + G.
To ungroup objects (including grouped objetcs, SmartArt graphics, EMF and WMF objects), select them and hit CTRL + SHIFT + G.
To learn other cool things you can group and ungroup in PowerPoint, see our ultimate guide on How to group in PowerPoint. To reform an ungrouped set of objects, simply select a single object from the previous group, hit CTRL + SHIFT + J. To rotate an object by 15° to the right, with an object selected, simply hit ALT + Right arrow. To rotate an object by 15° to the left, hit ALT + Left arrow. To move to the next cell, hit the TAB key. To move to the previous cell, hit SHIFT + TAB. To move to the next row, hit the Up arrow key. To add a new row at the bottom of the table, move your cursor to somewhere on the bottom row of your table and hit the TAB key. To insert a text indent in a table cell (like you would with the TAB key in a shape or text box), move to that cell and hit CTRL + TAB. With a charting element selected (such as the data labels or columns), hit CTRL + F1 to jump to the formatting options for that specific element. This charting shortcut works in both PowerPoint and Excel, and is one of the fastest ways to drill down to the specific formatting options for your charts. To move your chart like any other object, simply hold the CTRL key down, and then click the chart with your mouse. Doing so selects your chart like any other object, allowing you to use the Arrow keys to move it around on your slide. Hit CTRL + SHIFT + TAB to switch between the Outline and Normal View in PowerPoint. Holding the SHIFT key and clicking on the Normal View icon in the lower right-hand corner of your screen will take you to the Slide Master View of your presentation. Hit the shortcut again to come back to the Normal View. Holding the SHIFT key and clicking on the Slide Sorter View icon in the lower right-hand corner of your screen will take you to the Handouts Master View of your presentation, where you can customize the handouts for your presentation. Holding the SHIFT key and clicking on the Reading View icon in the lower right-hand corner of your screen will open up the Set Up Slide Show dialog box, where you can choose to show your presentation in a resizable window, run custom slide shows, etc. Holding the CTRL and SHIFT keys, and clicking on the Normal View icon in the lower right-hand corner of your screen will close the Thumbnail View and​ give you more work space for your presentation. ​Holding the CTRL and SHIFT keys, and clicking on the Normal View icon in the lower right-hand corner of your screen will open up the Outline View in full screen. In Microsoft PowerPoint 2007 and 2010, hold down the CTRL key, and in 2013 and 2016 hold the ALT key, and then select the Slide Show View icon in the lower right-hand of your screen to run a mini presentation in the upper left-hand corner of your deck. Hit ESCAPE to move to that slide. If you have multiple presentations open on your device, you can switch among them by hitting CTRL + F6. To switch between your active windows, hit CTRL + TAB. To see all open and active windows on your computer, hit WINDOWS + TAB. To cycle through the content placeholders on your slide (built on the Slide Master), first click into a placeholder and then hit CTRL + ENTER. Once you have cycled through your content placeholders, hitting CTRL + ENTER again creates a new blank slide, based on the slide layout you were just previously on. This shortcut adds a new blank slide to your presentation, based on the slide layout you were just on. The only exception is if you use this shortcut on the Title Slide within your layout, PowerPoint adds a new content slide instead of a new title slide (it’s smart like that). Hi the F12 function key to save your presentation with a different name, in a different location on your computer, or in a different file format. This is one of the secrets to protecting your presentation by saving all of your slides as pictures so someone cannot rip off your content. Hitting CTRL + F12 will immediately open the Save As dialog box to open a file on your computer, without having to navigate through the back-stage view. This shortcut opens the Find and Replace dialog box, allowing you to quickly replace text throughout your presentation. Be careful when using the 'Replace All' option, as it not only will cycle through the Normal View of your presentation, but all your Slide Master Views. If you have closed the find dialogue box and now want to repeat the last find action, hit SHIFT + F4. To take a screen capture of the current screen to the clipboard, hit the PrtSc (Printscreen) key. To copy the picture of a selected window, hit ALT + PrtSC (Printscreen). To launch the Print dialog box, hit CTRL + P. If you don't need to adjust the settings, you can immediately hit ENTER to print your presentation. This dialog box allows you to add and remove your date and time, slide numbers and footers. To properly add your headers and footers to your slides you need to add them in twice - once on your Slide Master and once in the Normal View using the Header and Footer dialog box. For help on this, see this article on fixing your page numbers. This PowerPoint shortcut closes the active file you are using, without closing the PowerPoint application itself. This is an operating system shortcut, and works in all the Microsoft Office programs. This is a Windows-level operating-level shortcut and can be used with any program you are running on your computer. After closing out of all of your active applications, this shortcut can shut down or restart your computer too. Use the following shortcuts for the given tasks in the new PowerPoint 2013 version. Note, these PowerPoint 2013 shortcuts all work in PowerPoint 2016 as well. Hit CTRL + ] to increase the font size in PowerPoint 2013. Hit CTRL + [ to decrease the font size in PowerPoint 2013. Although these are new shortcuts, the old font size shortcuts still work: CTRL + SHIFT + , to decrease the font size and CTRL + SHIFT + . to increase the font size. However, because the shortcuts above work in a wider variety of programs, I recommend memorizing them instead. If you want to show or hide the Notes pane in your presentation, simply hit CTRL + SHIFT + H.
To make a copy of your current open presentation in PowerPoint 2013, you need to hit CTRL + SHIFT + N.
To add a new section in your presentation, hit CTRL + , (comma). To zoom out of a slide or to see all slides in Slideshow View, simply hit CTRL + - (minus). Once zoomed out, you can use your Arrow keys to navigate around. To zoom into a slide in Slideshow View, simply hit CTRL + = (equal). Once zoomed in, you can use your Arrow keys to navigate around. Hitting this shortcut once collapses your Ribbon commands into the top of your screen, giving you more uncluttered work space in PowerPoint. Hitting CTRL + F1 a second time un-collapses your Ribbon commands. This is Microsoft Office shortcut, so it works in PowerPoint, Word, Excel, Outlook, etc. The NEWEST shortcut to hit the Microsoft Office suite delivering Distraction-Free Mode. Hit this keyboard shortcut to auto-hide your Ribbon commands, giving you a 100% clean working space. When you want to see all your Ribbon commands again, just hit this shortcut a second time. Note: This shortcut can easily get cross up with the Ribbon Collapse shortcut. To see a full demo of this, check out our article on distraction free mode and new Office 365 shortcuts. 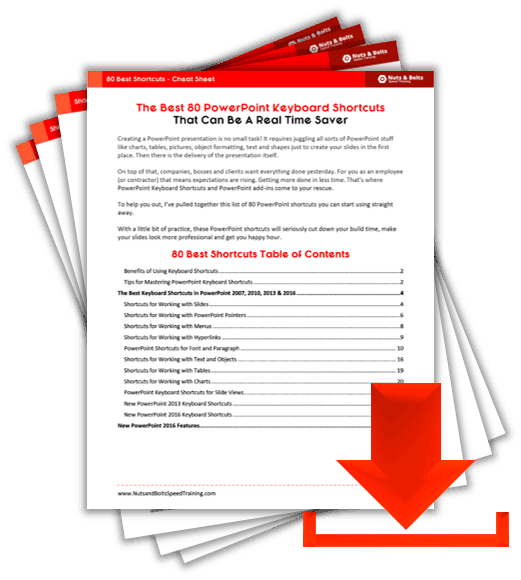 Where should I send you the PDF of these 80 awesome PowerPoint shortcuts? Yes, it's 100% FREE.